Rather than have a 'group' photo of my instruments, I thought that perhaps a short trip around the walls of my music room would be of interest. It won't take long because the room isn't very large. 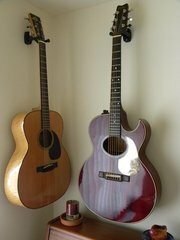 The guitars are pictured in the order I photographed them, starting at the left of the window. This is the first time I have ever had a music room and having the guitars readily available to play, simply hanging on the wall is amazing! 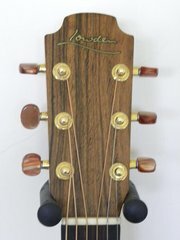 This is my Lowden L25 M shape Jumbo. 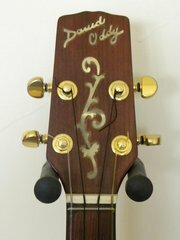 Rosewood back and sides, five-piece mahogany neck, rosewood bridge, ebony fingerboard and cedar top. A treasured gift from George Lowden, presented to me in 1988. 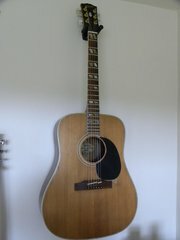 This guitar is utterly dependable whatever the situation and is of tremendous sentimental value because 1988 is the year my lovely daughter Fay was born. 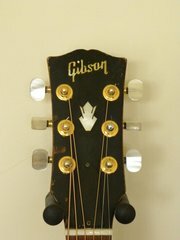 1964 Gibson SJN (Country and Western Model). Purchased in from Potters Music Shop Croydon in 1968. 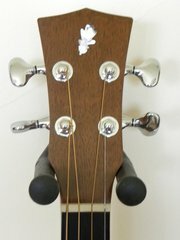 Mahogany neck, back and sides, rosewood fingerboard and spruce top. Original bridge replaced by Stephen Delft in the late 1970s. Of all my guitars I probably owe this one for the most songs I have written on it. I recently had some work done on it by Rob Lloyd and his 'set-up' has completely rejuvenated it and it now sounds better than ever. Because it has no pick-up, this one only comes out on the road when there is no PA and a good acoustic bounce in the room. This is my Powell six string guitar. Built by Ken Powell www.powellguitars.com and delivered by Ken personally to me at my Shining Friends www.shiningfriends.com birthday concert on 12/09/2009. 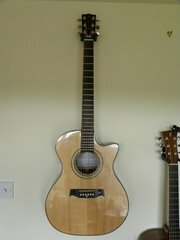 Iroko back and sides, mahogany neck, ebony fingerboard and bridge, with Sitka spruce top. 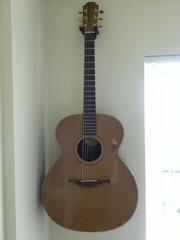 My Powell six string is a truly remarkable instrument, at the time of writing less than six months old but sounding very mature. The materials came from a store of hardwood left by my late father-in-law, John Hunt. John was a true fan of my music and derived a great deal of pleasure from music of many genres including the classics. When it came to singers and songwriters, Vin Garbutt was his very special favourite. Robinson Northwind Longscale No. 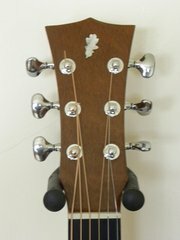 001 Built by Barry Robinson in 2001, it has a rosewood back and sides, a European spruce top and three piece mahogany and maple neck with an ebony fingerboard and bridge. playing a guitar like this was something that I often dreamed about, I tune it mostly in CGCFGC and the depth and warmth of the tone is sensational and simply hearing that has inspired a number of songs: Army and Navy, Dove and the Dolphin, When the Spirit Shakes the Tree, Listen and when I heard Black and White for the first time I knew I would only ever play it on my 'Robbo'. 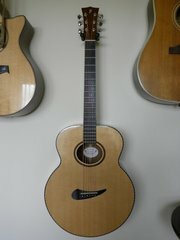 My 1998 David Oddy Cuatro. 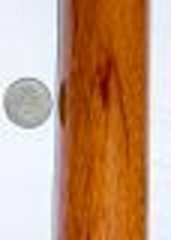 Mahogany neck, back and sides and rosewood fingerboard. 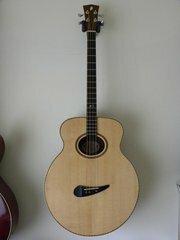 A generous gift from David in 2003 after a shared gig with Steve Knightley in Topsham, near Exeter. This is tuned almost the same as a ukelele (my first ever instrument) except that the top and bottom strings are an octave lower. It is remarkable how much effect this has on the timbre of the sound and how different it makes even the simplest of chords. 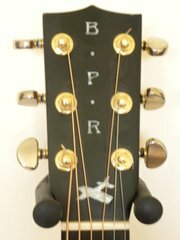 2009 Powell tenor guitar. Built by Ken Powell www.powellguitars.com constructed of material from the same source as the six string and delivered on the same day. The sound of this little guitar is tremendously resonant and full, at the moment I have it tuned in a mandolin tuning (big learning curve) and so the voyage of discovery is on-going. When Ken was carving the neck he discovered a blemish in the wood. When the shaping was complete the blemish was a very clear letter 'M' (see lower left picture) So I guess that makes it definitely my guitar! The coin is a five pence piece. Photo courtesy of Ken Powell. Left, Delft M shape, Built by Stephen Delft 1973, flamed maple back and sides, ebony fingerboard and bridge, five piece maple neck and spruce top Stephen purchased the wood for this instrument from a family concern in Switzerland, the gentleman was selling wood that his grandfather had cut and put to season; it was fifty years old before it arrived in England. 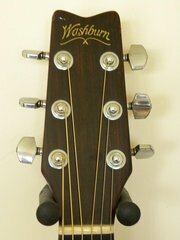 Right, Washburn 'Woodstock' Acoustic/Electric single cutaway thin body. 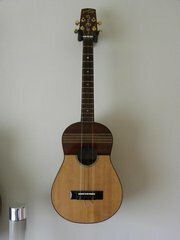 Purchased in Aarhus Denmark, 1982 by arrangement with Rudi Schlacher of Washburn Inc. Because of the body size the acoustic sound isn't that great but this is a 'get you out of jail with a crap PA' guitar, always sounds great whatever you play it through. The silver scratchplate was a birthday present in the 70's and has 'done the rounds'. Its been on the Washburn for a while, not sure where it will end up next.